I hope you're having a great day today!? I can't believe it's already August and the fall collections are already in the shops. Where did the time go? A quick life update: In two weeks my school starts again and I'm finally a senior in high school. I'm so happy that next year i can start a new exciting chapter in my life. There are still so many dreams and things I want to let come true and accomplish. This summer I wanted to have a summer job and after a few weeks I can already see how a job can change you and tell you so much. Basically my job is to help older people who need help for cleaning the house, need somebody to talk to or to do the groceries for. 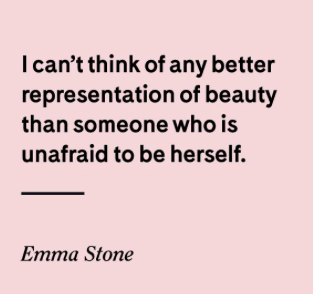 One old woman told me that she remembered the day she was eighteen years old and she told me that you have to follow your dreams when it's still possible. That really touched my heart and since then I started looking differently into the world and appreciating a the little things in life more. At first I thought why do I need a job, but looking back it's a great decision I've made. Well enough life lessons for now and on to my review! There is a jewelry store online where I came across that I instantly loved very much. 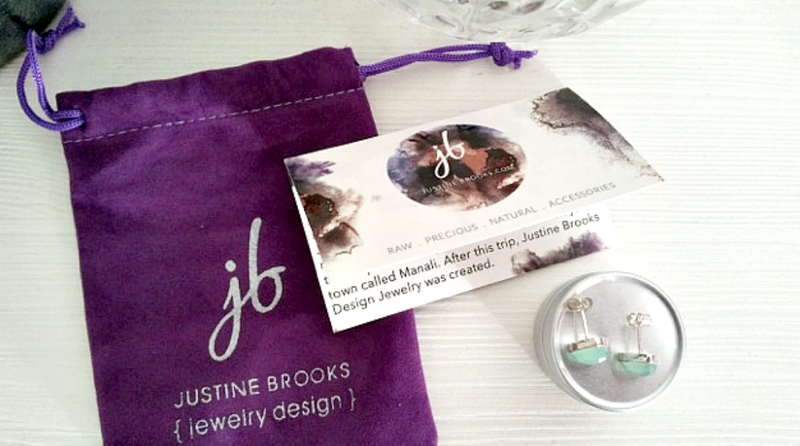 The jewelry brand is called Justine Brooks and is based in Canada. It al began when Justine showed her love and passion for design and researching stones and metal techniques. She travels the world to learn and discover new jewelry from different countries. In 2005 Justine studied traditional jewellery techniques in India which was her first real experience. The jewelry of Justine Brooks is inspired by all her trips around the world, creating a mix between east and west. 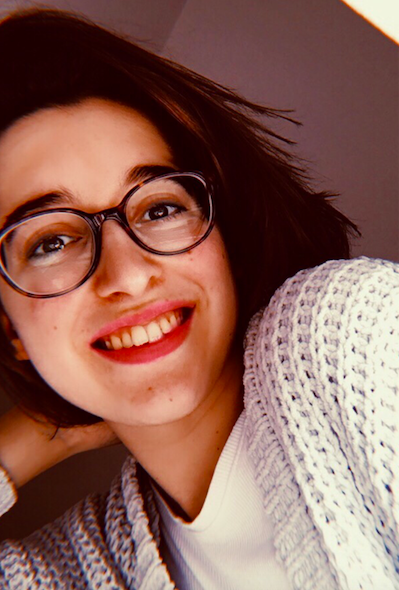 Designer Justine believes that the ability to discover other countries and cultures is the greatest gift in life. After she worked with ceramic pendants at the Emily Carr Imstitue of Art and Design, she wanted to work with jewelry. She then became a student at the Vancouver Community College Jewellery Art and Design program to learn more about metal smithing techniques. During her studies Justine Brooks already had her very own brand which was showcased at the Vancouver Fashion Week and she won Livings Design of the Year Award in 2010. Justine Brooks has always believed in never giving up. She believes in a healthy work/life balance which for her means playing sports, spending time with family and of course traveling. Her favorite sport activity is scuba diving. Her love for the ocean is can be seen in her new collection called the Silver Earth Collection. I was lucky enough to choose a jewelry piece from her collection. Her jewelry is very colorful and I love that all the items are very stylish but unique too. I just got my ears pierced a few months ago and I thought it was a nice idea to choose a pair of earrings. 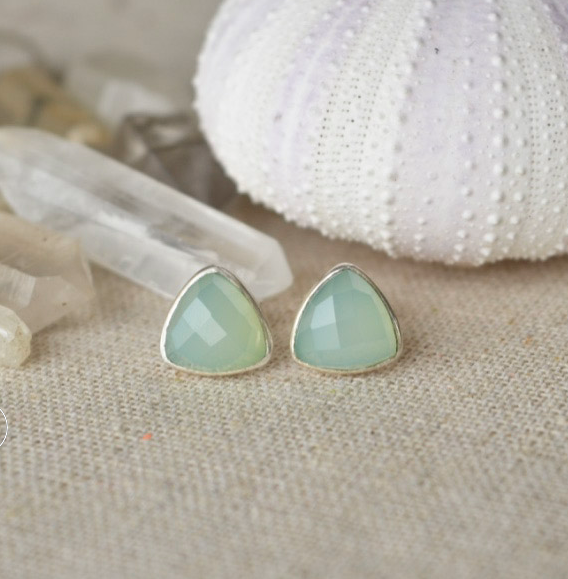 I picked the Aqua Chalcedony Triangle Studs which a perfect to wear daily. The delivery was very fast from Canada and I'm absolutely in love with my earrings they're so cute!! Each stone is 9 mm and the metal is made of sterling silver. 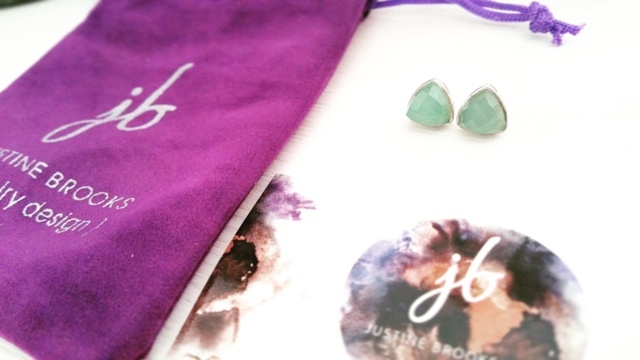 Overall I'm very happy I discovered Justine Brooks jewelry shop. The jewelry is very natural, unique and stylish and not like other brands. I definitely recommend checking out her webshop and take a look at her new collections for this fall. Oh these are super cute! I haven't heard of Justin Brooks but I'll need to check it out!